There are some ailments that you wouldn’t wish on your worst enemy – neck pain being one of them. Neck pain (also known as cervicalgia) is a unique animal to tackle: unlike knee pain, you can’t just ‘stay off of it’. Worse, when you have a neck injury, it’s almost impossible to rest your neck unless you’re fitted with a neck brace. Endless hours spent hunched over computer screens, tablets, and cell phones are a reality of living in the modern world. Unfortunately, this is leading to increased reports of neck and shoulder strain across all age groups. There are even increases in the number of young adults diagnosed with degenerative neck conditions due to what is now being called “text neck” (1). Your neck pain may be caused by common strains like computers and cell phones. Maybe you have a neck injury or other condition. Regardless, this list should give you some tools to help relieve your pain naturally. Note: if you have an actual neck injury or deformity, go over this list with your physician or physical therapist before attempting any exercise or movement listed below. Yoga has several benefits beyond temporary neck pain relief, including being able to help correct and prevent neck pain in certain cases. The overall goal of these yoga exercises is to gently realign your neck and spine. Most yoga exercises can be performed just about anywhere, and will only take a few minutes to complete. Listen to your body while performing these exercises, and never proceed with a movement that causes more pain. While you may be concerned about your ability to perform certain moves based on your flexibility – don’t be! There are several yoga positions you can use to work on sore neck and shoulder pain with little-to-no flexibility required. For the best results possible, perform these exercises daily. Over time, your neck and spine should strengthen and realign well enough that your posture improves and your neck pain will lessen or even disappear! Have you ever heard the phrase “you carry all of your stress in your shoulders and neck”? Sometimes a stiff neck and shoulder pain is caused by nothing more than stress and tension from daily life. Over time, the tightness in the muscles in your upper back and neck cause your spine to fall out of proper alignment. This will lead to a pain in your neck and sometimes cause tension headaches. In addition to taking steps to reduce your stress, massage therapy is a wonderful way to relax your neck. If you are able to schedule a professional massage, you should. Professional massage therapists are trained in relieving tension of the neck and shoulders. However, if you are strapped for time or cash, you can give yourself a massage. • or with some common household objects. Using your own hands is a great option, provided the motions of bringing your arms up to your neck don’t cause you more discomfort. There are a few massage specific tools such as a theracane (which has knobs on it to hit specific pressure points on your body), and foamrollers to apply pressure and release muscle tension. If you don’t want to buy a fancy tool, tennis balls and towels or strong scarves can be just as effective with proper use. To find out how to do some massage techniques here. Similar to yoga, neck stretches and exercises aim to strengthen your neck. 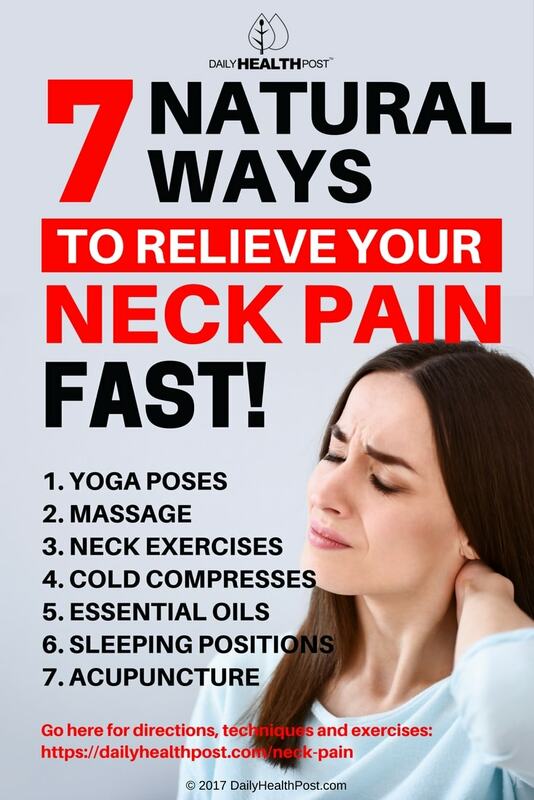 You should expect to have some immediate neck pain relief. Through consistent practice of these exercises, you’ll have less pain in the long run. The important thing to remember is to continue stretching and exercising after your pain subsides. A stronger neck is less likely to fall out of alignment and cause pain. Most neck exercises are simple and can be performed almost anywhere. The best strengthening exercises focus on more than just your neck, since problems in other parts of your body can affect your neck muscles. For more in-depth information and a list of exercises, follow this link. Cold therapy serves two purposes: pain relief and reduced inflammation. Applying a cold compress or an ice pack can numb the area for a short while, giving you almost immediate pain relief. The pain may come back some when the cold wears off, but it won’t be as bad because the ice reduces swelling. Muscle inflammation is a natural process that occurs with overuse or injury. It causes soft tissue swelling and draws healing white blood cells to the area. The white blood cells help you heal, but the swelling can cause pain and a stiff neck. Place an icepack over your neck for up to 20 minutes at a time. Wait at least 40 minutes until the next application. For best results with chronic neck pain – not usually associated with swelling – alternating heat pads and ice packs can provide extra relief. People that incur actual neck injuries should ice their neck for the first 24-48 hours. After that, applying heat will reduce stiffness and relax the muscles. Combine two parts water to one part alcohol in the first plastic bag. Try to remove as much air as possible from the bag before sealing it for best results. Put that bag inside of a second freezer bag, seal, and freeze the contents for at least one hour. Wrap the bag in a towel before applying to your neck. Essential oils are an effective alternative to over-the-counter medication. Their popularity is increasing exponentially every year with the introduction of pure, organic essential oils into the marketplace. Essential oils are strong, concentrated extracts from plants. They have been around for thousands of years and are the origins of much of our modern prescription medication. In fact, aspirin is derived from the bark of the white willow tree. Powerful opioid medications such as morphine come from the opium poppy plant. Popular pain creams often use essential oils due to their potency and effectiveness. There are several essential oils that are effective in treating the pain in the neck. Some of the more effective essential oils for neck pain are peppermint, wintergreen, marjoram, lavender, copaiba, and eucalyptus. “Hot” oils like peppermint and wintergreen decrease pain and inflammation. They reduce stiffness and also reduce muscle spasms. It is important to dilute these oils with a carrier oil like coconut oil or olive oil before applying to the skin, as they can cause a burning sensation. Not all essential oils are created equal. Most essential oils found at your local supermarket are not pure, even though they may be labeled 100% pure. Try to find a brand that uses 3rd party testing to verify purity. If you are unable to or are pressed for time, use this rule of thumb when deciding which brand to buy: if the oil has an expiration date or says “not safe for ingestion”, the oil is not pure. Almost everyone has experienced the sore neck that results from ‘sleeping wrong’. Falling asleep or waking up with your neck twisted or stretched out is one way to ensure neck pain the next day. Sleeping on your stomach, for example, is one of the most common neck pain causes. On the other side of the coin, there are some sleep positions that can help relieve neck pain while you sleep. The best sleep positions are either on your back or on your side, in a fetal position. Regardless of which position you chose, you should make sure you are using a good, supportive pillow designed for your preference. How to you find the best pillow for neck pain? That depends on the position you sleep in. It is important to keep your neck and spine in a neutral (read: straight) position while sleeping. Since different sleep positions require a different level of support for a neutral spine. As such, pillows shouldn’t generally be treated as one-size-fits-all product. The most common sleeping position, as well as one of the best for your back – with the right pillow! Aside from preventing neck pain, a good side sleeper pillow will also take pressure off your shoulders, preventing shoulder pain. In order to do this, the pillow needs to be firm enough to keep your head elevated enough for your spine to remain relatively straight. (try these exercises to relieve this pain until you get a proper pillow). Not recommended. Plain and simple. Unless you’re sleeping on a massage table with a cut out for your face, there is no way to sleep on your stomach without straining your neck. While most pillows aren’t designed for every sleeping position, this therapeutic pillow can simply be rotated for your preferences. Depending on how bad your neck pain is, one position may feel better than another. If you are a side sleeper, try sleeping on your left side for additional benefits! Acupuncture is an Eastern medicinal treatment that has been around for thousands of years. It is one of the most widespread forms of therapy for mental and physical ailments. Acupuncture is widely recognized as an effective form of treatment for anything from pain to depression to digestive disorders. How does acupuncture work? Think of it as a more focused version of massage or acupressure. There are pressure points on the body proven to affect certain parts of the body. In Chinese medicine, this concept is referred to as qi. By placing pressure on these specific points of the body, qi is allowed to flow freely and restore balance. Massage and acupressure are limited in the amount of pressure that can be placed on any one point. An acupuncturist is able to place a small, sterile needle into these pressure points. This creates a very intense, localized pressure at the point of insertion, with little or no pain for the patient. Acupuncture benefits extend beyond pain relief. Modern research trials confirm acupuncture’s ability to positively affect the body’s nervous, endocrine, and immune systems. Since neck pain has a wide variety of causes, acupuncture may be one of the best non-narcotic treatment options available to neck pain suffers.